I had a somewhat disturbing revelation the other day at church. My wife and I usually go to second service and for some reason we always seem to be a few minutes late. As we walking in someone said “you’re getting a reputation for being late to second service”. A “reputation for being late”… not something I want on my resume. I was mad at myself and I vowed that things would change. When I got home I did a little thinking about the problem. I realized that over the past few months time seemed to be shifting backwards and I found myself being a few minutes late for different things… work… church… and other meetings. Never more than a few minutes… but enough that people noticed. I decided I needed to do something about it. 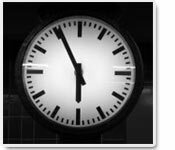 What would happen if I was five minutes early instead of five minutes late… would people notice? Would it make a difference? I started timing things and I suddenly became aware of just how long things actually take. The drive to work actually takes 15 minutes instead of the 10 that it used too. How could this be? When I plotted it out I found that the addition of three new signals slowed my progress down a few minutes each. There is a lot more traffic than there used to be. I timed things at home and found the five minute shower had turned to a ten minute one. Taking my lunch took an extra three or four minutes and feeding the dogs with a new kind of food added a couple more. All of a sudden I could see the almost imperceptible problem emerge. Everything added together was slowing me down. The half hour I used to plan on for getting ready and driving to work was now taking longer. Thirty minutes would not work anymore. I decided to make a new habit by doing a ten minute transformation. My schedule was turned around backwards. I started doing the routine stuff when I got up instead of waiting until it was almost time to go to work. I made my lunch earlier and got the dog’s food ready in advance. I put a little clock in the shower. I started arriving five minutes early instead of five minutes late. This small little change has made a real difference in my life. The stress level is much lower when I’m early and I don’t yell at drivers to get out of my way anymore. I arrive refreshed instead of uptight. I actually have time to check my e-mail and get a cup of coffee before the day starts. I’m still tweaking things and every once in a while a unforeseen thing comes up but for the most part I’m five minutes early. It’s a simple little change and it’s becoming a new habit this month on my 12 habits program. Nothing earth shattering… but I think people notice the difference. I received an interesting comment on my last post, “Never Blog Alone“. It was from fellow blogger Phi and it related to his experiments with polyphasic sleeping. Phi states that he has had great results with a core three hour sleep period followed by three strategically placed 20 minute naps throughout the day. This relates well to my experiments with “Qudraphasic sleeping“, where the day is broken down into 4 quadrants and includes a long sleep period and two naps. The difference can be seen in the 24 hour graphs below where green is sleep time. I really like Phi’s modified schedule. It provides the 3 hour core sleep containing two 90 minute REM sleep cycles along with only three naps. The great thing is you will only need to take one nap during the average 8 hour workday which can be done at lunch. This schedule would work for the average worker whereas the traditional polyphasic schedule would have you napping two or three times during an average 8 hour workday. As you can see from the graph it is identical to a quadraphasic pattern with the addition of 3 to 4 hours of productive “awake” time. I have tested this in the past when I have had a big project due and it works for me in the short term. It will be interesting to keep up with Phi and see how it works for him long term. He has reached his 30 day milestone with no ill effects so it sounds promising. Phi mentions that to make this work he has dropped caffeine from his diet and is eating healthier meals. In my experience I have found that “low glycemic” meals of 500 calories or less along with similar snacks are the best when following a modified sleep schedule since they will keep blood sugar levels constant. Check out Phi’s post here. I picked up the book “Never Eat Alone”, by Keith Ferrazzi a while back on a recommendation by Dwayne Melancon over at Genuine Curiosity. The book’s premise is to build a lifelong community of colleagues, contacts, friends and mentors. The author gives many examples of building relationships that can have a great impact on your job, business, and personal life. This will be a great addition to my “MBA on the Run” program over the coming months as it gives an interesting perspective on networking. Make a list of the things you are most passionate about. Use you passions as a guide to which activities and events you should be seeking out. Use them to engage new and old contacts. If you love baseball, for example, take potential and current clients to a ballgame. It doesn’t matter what you do, only that it is something you love doing. This is great advice and it plays especially well with blogging. I’ve met so many interesting people through blogs that share many of my own interests. The blogs often complement my own views and sometimes challenge them. I have found that when posting an article it is a great practice to link to other blogs with similar themes and ideas. This way the reader can get a broader viewpoint and find additional content that will make the subject come alive. I would like to share a few of my favorite blogs and the subjects they cover. Management: Working with people on the job can be one of the greatest challenges of life. Especially if you find yourself playing a management role. The following blogs can make all the difference in helping you craft a positive and nurturing relationship with co-workers. Rosa Say and Lisa Haneburg both have exemplary blogs about the subject of management and business leadership. Rosa adds the Hawaiian Spirit of Aloha while Lisa adds High Impact to her presentations. Great stuff! Life Administration: Are you looking for the latest tip to make your life easier? Check out Merlin Mann’s, “43 Folders“. His Getting Things Done focus is helpful and his writing style adds humor and interest. Lifehacker and Lifehack.org offer a daily assortment of tips and tricks on everything from computer maintenance to movie reviews. Always interesting and entertaining! Sleep Hacks: I’ve been doing some personal experiments with napping and diet and have had some interesting results. I have been keeping up with Steve Pavlina and Jacob Cazzell as they write about their experiences with different sleep hacks. Steve’s polyphasic sleeping adventures have been amazing and I realize that I could never follow the routine. Jacob’s route has been interesting as he has written about what works and what doesn’t on a daily basis. Interesting stuff. Creative Stuff: Looking for some great ideas to get you fired up for the week? Check out Genuine Curiosity and Slacker Manager. Dwayne and Bren always have new and interesting posts about a wide variety of subjects. Dwayne has a great post today about putting goals on your computer screen. I’m going to take his idea and put the habits from my 12 habits program up on the screen. Great reminders. Bren’s post today about the “Digital Hierarchy of Needs” is a must read. There are many other sites that I visit for inspiration on a regular basis. Blogs offer a great interactive conversation without leaving the comfort of your computer chair. When posting… Never Blog Alone! Have you ever been in a long line waiting to get someplace only to find out at the end you were in the wrong line? I had that experience over the weekend. My wife and I attended the NASCAR race over the weekend at LV Motor Speedway. There were over 175,000 people in attendance and everyone wanted to get out when the race was over. We knew it would take a while exit since we had been to the Busch race on Saturday, which took about 90 minutes to get to the freeway. The 15 Freeway is the major artery for entry and exit to the track and this section of road is only two lanes. Add 175,000 people and you have a standstill. On Sunday we lined up a different way to get out of the track. We were in a line that was headed North out of the parking lot and you could see it led right up to the freeway. The line was three cars wide and moved slowly along. When we finally got up to the exit of the track the line curved to the right along a frontage road. All of a sudden we were circling back around the track. The line crept along at a snails pace but we finally made it to the exit on the other side of the track. We could see the main street ahead but a strange thing happened. Instead of being able to turn right and head back to town, all of the exiting traffic had to turn left. Here we were in the middle of the desert heading in a line that went on forever. It turns out that the access road went for six miles North and finally ended up on the 15 freeway, six miles above the track. We now had to go six miles south to just get back where we started. This was unbelievable! It took over 5 hours to get back to our hotel which was less than 10 miles from the track! A precept of Steven Covey came to mind as we started and stopped in the middle of nowhere. “Begin with the end in mind”, played over and over in my head. How could I be so blind as to end up in this crazy line? After all, all these thousands of people were doing the same thing! How could so many people be so blind? If I had just asked somebody where the line went I would have never got in it. I would have exited out the south entrance just like we did on Saturday. Following the crowd can be a dangerous thing. Unless you know the destination, the crowd can lead you places that you would never go on your own. When we examine the life roads that we are on we really need to know where we are going. We need a roadmap, directions, and a guide. Do you have a roadmap for your life? Have you sat down and planned out your destination? Do you have written goals or are you just following the crowd??? This has been an incredible weekend. On Saturday I posted an article entitled “MBA on the Run“. The concept of the article is to listen to MBA related Audio books on a Ipod while walking through interesting business districts. Sounds like a crazy idea doesn’t it. I have to say this is one of the most incredible things I have ever experienced. When I wrote the article I had no idea how profound the experience would be. Last night I picked up Rich Dad, Poor Dad , by Robert Kiyosaki from Itunes and downloaded it onto my Ipod Mini. I decided to follow through with my plan and I drove down to Old Town Murrieta which is a few miles from where I live. I parked in a strip mall on the edge of the main street. The Audio book had been playing while I was driving in the car so I had an overview of the first chapter. I plugged in the earphones, put on my jacket, and clipped the Ipod to my belt. I started walking south along Washington Ave about 7pm. The story on the Ipod was one of two boys growing up in Hawaii in the 1950’s. The reality I was seeing was an old town that could have been out of that book. As the Author talked about his adventures growing up and the lessons that he learned it was if I had been transported back in time. Robert talked about working in Mrs Martin’s store for 10 cents and hour… I looked across the street and there was the rustic Murrieta Market. There was a young boy in the door dust mopping the floor and shaking the dust off in a huge cloud. Probably the same thing had been happening for 40 or 50 years… different kids… different times.. I walked further and I passed a Bar & Grill. The noise was loud and somebody inside was causing a commotion. I walked past the entrance and the story on the Ipod talked about people who didn’t understand how money worked would always be spending their money on frivolous things like alcohol and gambling. This was getting more profound by the minute. I continued down the street fascinated by Mr. Kiyosaki’s stories. The words were literally before my eyes. As I reached the other end of town, I crossed the street and headed back. I soon heard people singing and I noticed a very small church building off to the left in the darkness. It could probably hold 30 people at the most. There was a glow around the front door and the singing got louder as I approached. All of a sudden the front door burst open and a young gal came running out at full speed. She ran right in front of me and continued down the street to a tattered mini van. She grabbed a book out of the back, muttered a faint hello, and hurried back in. The interesting thing was there was no name on the building… no worship times , no denomination, … nothing. The audio book was talking about the desperation of people and businesses that didn’t understand financial principles. I couldn’t help thinking that this church needed to invest in a sign so the people of the neighborhood could get more information. Why wasn’t there a name or other information? If I lived nearby how could I get involved? It seemed so odd. And then it got more interesting as I walked further. Across the street there was more of a ruckus at the Bar. The noise level increased and someone was yelling from the front porch. What would happen if that little church had an outreach and a name, I wondered? I continued on and Robert talked about the lesson’s he learned from his rich dad and how he invested in Real Estate. The stories of how he took dilapidated old buildings and turned them into high rises. I looked up to see an amazing dichotomy. On one side of the street was an old house from the turn of the century… boarded up and a rickety for-sale sign hanging from a post. The other side was a new two story office building that was under construction. I had now reached the other end of town and I headed back to my car. When I opened the door I turned off the Ipod and I was suddenly transported from 1956 back to 2006. I can’t tell you how amazing this short little journey was. I will finish this audio book up in the next few days and then I hope to interview someone who has learned some of Robert’s financial principles. This book tells an amazing story..
Back to the future 2006… Wow! I received an invitation in the mail the other day to attend a MBA presentation put on by the University of Redland’s School of Business. They just opened a new branch in Temecula so I called and got more information. The sticker shock was expected but the overall program will probably not work for me. With my education background and my focus on technology certificates instead of a degree, I would be looking at 4 to 5 years of work to complete the program. The price tag in the $50,000 dollar range will also be a little difficult to justify. I work in the K12 education field and master degrees are very common and required for upper level management. A few of our senior cabinet members even have doctorates. Given my age and my goals I have some interesting choices. I can bite the bullet and spend the next 4-5 years of my life with little spare time and a singular focus or I can pursue something a little different. In researching this topic I’ve found many other people in the same quandary. Most people are frustrated but I found an interesting little manifesto on changethis.com that may help. Entitled “The Personal MBA“, this program consists of reading 42 books on business and applying what you learn to increase your effectiveness at work. Can a traditional MBA program help you? Yes. You’ll meet a lot of great people and get acquainted with a few professors and corporate HR recruiters who can help you land a new job. You will also sink very deep into debt. If you decide to enroll in a full-time program, the opportunity cost of lost wages and future investable savings is huge. Will a traditional MBA teach you anything you can’t learn by yourself? Probably not. Classroom discussion can be beneficial, but there’s nothing presented that you can’t learn by studying a good book on the subject. Is a traditional MBA worth the time and money? Sorry – there’s no universal answer. If you’re looking to go into advanced corporate accounting, finance, quantitative analysis, commercial real estate, consulting, venture capital, or investment banking, an MBA or MS in a business-related field may be expected or required. In those cases, caveat emptor: once you decide to attend, the only certainty is that your bank account will be significantly smaller. The bottom line: You get the education but not the piece of paper (degree) that may be critical. After looking at the list of books and the probable time commitment, I considered doing this. I asked myself the question… How will this fit into my time schedule and can it be somehow worked into my 12 habits program? When will I be able to read 42 books? I thought to myself… I’m already time strapped and a commitment this big may not fit. Just then my e-mail popped up and there was a special offer from Audible.com for audio books. Another light went on… it was getting brighter..
Do this program while walking or exercising… something I’m already doing 30 minutes a day. An MBA on the Run! So here is my plan and my 6th habit in my 12 Habits quest. Listen to two new audio books a month and create two new articles or posts about the subject. While putting together the material interview a real-world business owner about the subject. My first Audio book will be “Purple Cow” by Seth Godin and I plan to listen to this while walking through Old-Town Temecula. The goal will be to assimilate the material and find a remarkable business that is truly a “Purple Cow”. A short interview with the business owner should make the material come alive. I’ll need a few materials to make this happen. Technology is the key to success. The exercise part of this plan is compatible with Five Factor Fitness and Core Performance Essentials routines. Since this program will use Audio books the book selection will be somewhat different than the Personal MBA, since some of those titles are not available in Audio form. I will purchase some of the books that are good for reference in both audio and bound versions. Given the two books per month timetable a great education can be put together over the span of two years. The synergy of this program combining exercise, learning, communication, and writing is very powerful and it ties in great with my ongoing 12 habits program. The entire cost of the whole program… under $1000 including the Ipod, pocket recorder, Naturally Speaking software, and 50 audio books. This is much cheaper than any conventional MBA program that I have found. The upside is a great wealth of blogging material, an online thesis, and online stories (and possible podcasts) of real business success. This may not be a conventional MBA with a sheet of paper but I think this might look pretty good to a prospective employer especially with comments and feedback from readers of this blog. I picked up all of the materials this week and they work great. Naturally speaking is amazing and the little pocket recorder will record up to 8 hours of speech. 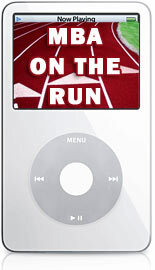 The Ipod allows you to bookmark sections of the audio book for future reference.